A fun-filled festive celebration of Christmas Carol and Music Hall! 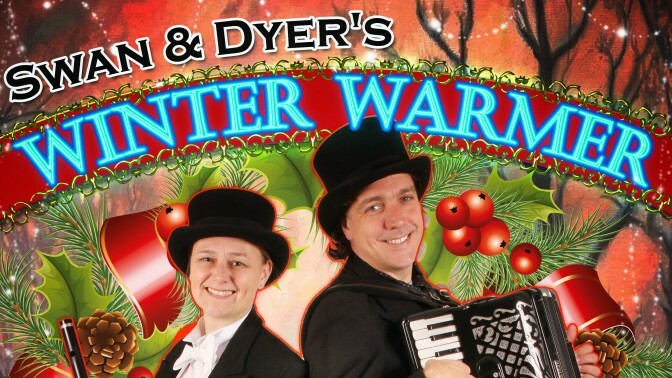 Vicki Swan & Jonny Dyer perform well-known sing along Christmas carols interspersed with famous Music Hall numbers. Numbers such as “Daisy, Daisy”, “The Man on the Flying Trapeze”, “Waiting at the Church” are mixed in with all time favourites such as “Silent Night”, “Jingle Bells” and even the virtuosic “Theme and Variations on the Carnival of Venice” (better known as “My Hat it Has Three Corners”). Performed in Victorian costume this event will appeal to everyone young and old with the joy of being together as a family and a community. The evening is light-hearted, humorous and fun. We’re confident that everyone will be singing along from the first number until the very end.